GABÈS. Tunisia, Jun 7 2013 (IPS) - The story of Gabès and the local phosphate industry follows a plot that is all too familiar: an underdeveloped town located in an industrial region boasts one major lucrative industry with high output and export values, but the local population and surroundings experience alarming levels of illness and environmental blight. But locals are no longer remaining as silent as they once were, holding a festival to mark World Environment Day on Jun. 5 and taking other actions such as protesting and using anti-pollution graffiti to increase awareness about the situation in Gabès. The sixth largest city and a major industrial hub in southern Tunisia, Gabès is home to the state phosphate processing plant. The factory, operated by Group Chimique Tunisien (GCT), processes phosphate from Gafsa and the interior of the country into phosphorus, then exports the product worldwide. Gabès’s industrial sector dates as far back as the middle of the twentieth century. By 2007, with an annual output of phosphate reaching 8 million tonnes, Tunisia became fifth in the world for phosphate production. “It is an enormous industry” amounting to 30 percent of Tunisia’s gross national product (GNP), says Haythem Nasfi, director of the Gabès branch of the Institute for War and Peace Reporting (IWPR). GCT employs 3,000 workers, and on days when the production cycle runs at full speed, daily profits can reach 11 million TND, roughly 6.8 million U.S. dollars. But with a vast industrial zone less than one kilometre from the edge of town, the factories’ activities inevitably have severe repercussions for both human health and animal life. Gabès has the highest rate of cancer in Tunisia, and in the neighbourhood closest to the factory, Chott Salam, lung cancer can be found in one out of 10 households. Kidney cancer rates are slightly higher, with 12 percent of families affected. Likewise, bone fragility, allergies and stillbirth all feature higher than average rates. "You always want to sleep. You never have enough energy [in Gabès]." “Everyone is tired. You always want to sleep. You never have enough energy,” Nasfi said, citing a common complaint among Gabèsiens. Simply taking a short trip to the nearby touristic town of Matmata leads to a dramatic improvement in mental facilities, he added. Meanwhie, the Oasis of Chott Salam, which is located directly beside the industrial area and once teemed with bird and animal life, has become more of an industrial wasteland, unsuitable for wildlife or recreation. Local fish populations suffer too. Since 1965 over 200 species have been lost, reducing biodiversity in the gulf to as few as 15 fish species. The natural ecosystems inherent not just to this now damaged oasis but also to the entire Gulf of Gabès are unique, their warm waters providing a special reproduction zone for species of the Mediterranean Sea. Noteworthy here are the waders and waterfowl, as well as marine vegetation such as seagrass and posidonia. According to ecologist and designer Safouane Azouzi, a native of Gabès, Chott Salam is considered the only maritime oasis in the world. Yet currently over 400 sources of fresh water feeding into the oasis have dried up because of chemical pollutants, and the loss of adequate habitat and sources of uncontaminated water has forced many species to either find other habitats or simply dwindle in number. Authorities have so far kept silent on the pollution issue and have yet to openly admit that the problem exists. Most Gabès residents believe that the government simply doesn’t want to cough up the money for its modernisation. 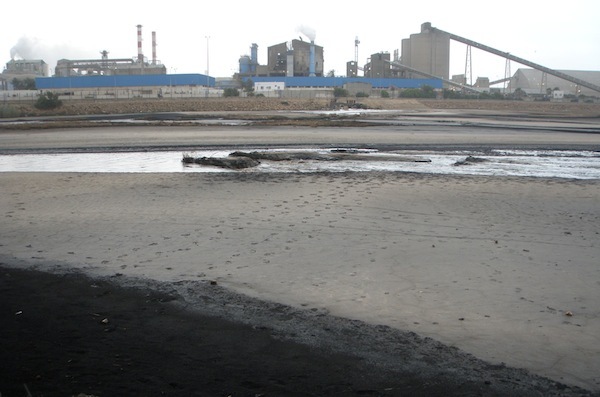 The most critical reform would involve ending the large-scale discharge of phosphogypsum, a by-product of the production cycle. The organisation SOS Environnement Gabès asserts that the daily amount of phosphogypsum that is leaked into the sea reaches a whopping 28, 720 tonnes. Phosphogypsum, a radioactive reaction of phosphate ore with sulfuric acid, are strewn across the ground leading from the factory to the sea, and waves pounding the empty beach consist of ink-black water. In the United States, large quantities of phosphogypsum are required to be stored in sequestered large stacks. But while no palpable steps toward factory reform have been observed by the citizens of Gabès, environmental activism has been taken to new heights. The city now boasts 23 civil associations working to bring the pollution issue to the forefront of public discourse. The results are paying off. “Stop the Pollution” graffiti adorns the facades of numerous buildings, and non-violent protests such as roadblocks frequently figure into the routine used by campaigners. The Association to Protect the Oasis of Chott Salam has spearheaded recent awareness-raising efforts, including a festival staged on the Jun. 5, World Environment Day. Over 1,000 participants marched through the streets to the scene of the festival, chanting, “We want to live.” Even more locals visited information stands or listened to anti-pollution rap and hip-hop. Organiser Neder Chkiwa remarked that the previous year witnessed only a fraction of the current level of interest. The organisers have packed the month of June with numerous events, such as distributing flyers in shopping centers or holding anti-pollution graffiti contests. The possibility for citizens to actively engage with this issue is in fact one of the benefits of living in Tunisia after the revolution. “During the time of Ben Ali, people might have complained behind closed doors,” Nasfi told IPS. Yet today this taboo has been broken, and not only citizens can discuss the problem openly, but they have also become de facto environmentalists. Before the revolution, any open act of protest would have been unthinkable. “You would have gone straight to jail” Chkiwa noted. SOS Environnement Gabès has been operating under the radar for a number of years, and they are particularly pleased with the new possibilities to protest. “We pin a lot of our hopes on the new generation, which has the most at stake and deserves to have healthy living conditions, without having to flee the city,” a member of the organisation, who requested anonymity, told IPS. “But I remain optimistic that things will soon pick up, and we will experience real change,” Abdelwahad concluded.